It’s hard for me to pick an absolute favorite Paul Simon, but like so many people, his album “Graceland” is damn close to perfection. That is why I was pretty excited for the release of the 25th anniversary edition. It’s amusing. I had put it on my Amazon wish list with the intention of buying a copy for myself and another one for my father for Father’s Day. However, instead my aunt bought a copy for me from my wish list for my birthday leaving us to just purchase one copy for my father. Zany Amazon.com shenanigans. Here’s the deal though, for a really reasonable price, like under $20, you can get the 25th anniversary “Graceland” album which includes 6 bonus tracks and Simon telling the story of “Graceland” AND you’ll get the DVD documentary “Under African Skies” which isn’t some shoddy piece o’ crap thing, it’s done by Joe Berlinger, the guy who did the Metallica documentary “Some Kind of Monster” and a handful of music videos. That’s a hell of a lot of “Graceland” going on, so what’s the big deal? Paul Simon’s “Graceland” is generally credited with introducing African music and musicians to the West. The biggest being Ladysmith Black Mambazo. Many point out that during a time when most American’s experience with Africans was seeing starving children in television ads, “Graceland” introduced America to a jubilant, celebratory people. It’s true that much of the music on “Graceland” is mid or up tempo, although to be honest with you all, I always found the songs on “Graceland” haunting. Lyrically I found they lingered in my mind and the songs still do. 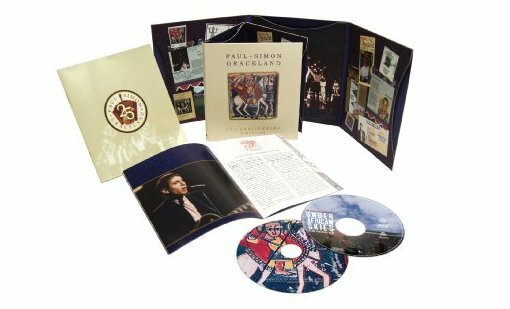 Unlike much of the other music I listened to in 1986, Paul Simon’s “Graceland” still speaks as relevantly today as it did the day it was released. A pretty impressive hat trick. Of course, he is Paul Simon. Oh, and if you watch the documentary and hear Simon talk about the level of work he put into writing the lyrics your mind will be blown. I once heard comedian Louis CK talk on Marc Maron’s WTF podcast about when he develops a real strong closing 5 minutes to his routine, the kind that drives the audience wild, he’ll cut it so he’ll be forced to make the rest of the act stronger. Paul Simon kind of worked like that writing the lyrics for “Graceland”. The stuff that survived, whoa. So obviously I love the album, and was tickled to have the few extra demos and alternative versions that the 25th anniversary version of “Graceland” offered. Here’s the thing though, the documentary “Under African Skies” was a really big deal for me. First, it was incredibly exciting as a fan to see so much footage of the actual recording sessions of Simon in South Africa with all the artists. And the documentary is loaded with interviews, some with unexpected people such as; David Byrne, Oprah, Quincy Jones, Philip Glass, Paul McCartney, and Vampire Weekend. The biggest thing with “Under African Skies” was it opening my eyes to the before now unknown to me controversy that surrounded Paul Simon’s “Graceland”. I was 10 years old when “Graceland” released. I didn’t know about apartheid in South Africa, I didn’t know who Nelson Mandela was or that he was in prison, and I didn’t know there was a cultural boycott that Simon essentially broke when he made “Graceland”. I didn’t know there was a situation. As if that wasn’t enough drama, certain segments of the African American community looked at “Graceland” as Simon basically using Africans. There was a particularly brutal exchange when Simon was doing a Q&A at Howard University and a student was accusing Simon of simply stealing music from African artists. Simon asked the student something like, don’t you think we can share ideas? And the student’s answer was in effect, if it’s with you, no. You think I will cut you? No one talks to my Uncle Paul like that! Forget I will cut you, I will take a sledgehammer straight to the crotch of those parachute pants! There were bomb threats called in to venues Paul Simon was scheduled to perform at while touring with “Graceland”. Bomb threats to Paul Simon shows. Watching “Under African Skies” gave me a new appreciation of “Graceland” and its role in music, and cultural, history. It’s easy now that we’re on the other side of apartheid to say, well, it worked out so how Simon went about making “Graceland” was okey dokey. I don’t know how 10 year-old Rebecca would have reacted at the time. I suspect in extremes. Either “Everyone leave Uncle Paul alone, he’s the greatest and he knows what he’s doing” or “Oh no! Uncle Paul condones apartheid!’ Adult Rebecca knows that apartheid was absolutely bad, bad, bad, but who am I tell artists in America or Africa how to react in the face of injustice and cruelty. If Simon and his band of truly merry, wonderful South African artists hadn’t thrown caution to the wind, the world may never have known “Graceland”, and in my opinion, that would be a terrible world to live in. Here’s Paul Simon performing the title track “Graceland” live in Zimbabwe. Back in ’87 Zimbabwe was a more stable location to perform than South Africa. How times have changed, right gang? And here’s another favorite of mine, “The Boy in the Bubble”. It’s amazing how the lyrics could very well be about today. Even the sound is modern. Uncle Paul is pretty cool. Next postHardcore Zen Strikes Again!